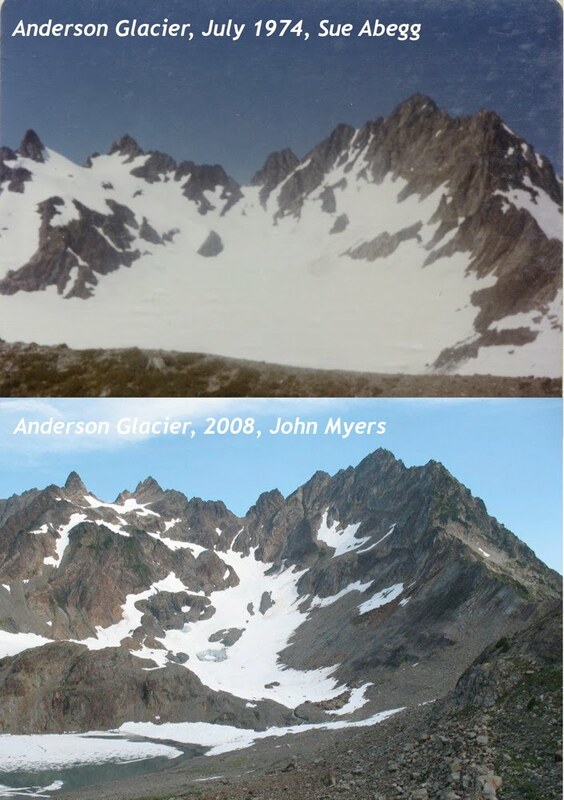 This page displays some glacier comparison photos showing the dramatic shrinking in the last century of the range's glaciers. Anderson Glacier in 1936. Photo by Asahel Curtis, from the Historic Photo Collection, courtesy of the Washington State Historical Society, Tacoma, Washington. Geri-Freki Glacier in 1910. Photo by Asahel Curtis, from the Historic Photo Collection, courtesy of the Washington State Historical Society, Tacoma, Washington. Geri-Freki Glacier in 2005. Photo by John Myers. Humes Glacier in September 1890. Photo by Bernard J. Bretherton, courtesy of National Archives and Records Administration, Washington D.C. Humes Glacier in 1913. Photo by R.L. Glisan, from the Mountaineers Glass Slide Collection, courtesy of Special Collections, University of Washington Libraries, Seattle, WA. Humes Glacier in August 1951. Photographer unknown. Courtesy of the Mountaineers. Ice River Glacier in 1924. Photo by Joseph C. Jeffers, courtesy of Jeffers Studio, Olympia, Washington. Ice River Glacier in 2006. Photo by John Scurlock. White Glacier in 1924. Photo by Joseph C. Jeffers, courtesy of Jeffers Studio, Olympia, Washington. White Glacier in 1936. Photographer unknown. From the Olympic National Forest Collection, courtesy of the National Archives and Records Administration, Washington, D.C.
White Glacier in 1944. Photographer unknown. White Glacier in 1963. Photographer unknown. White Glacier in 2005. Photo by Tony DiBenedetto.